Calendar (Lat. 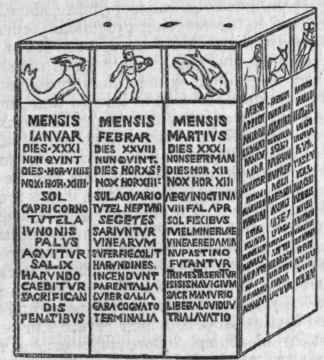 calendarium, from calendce, the first day of the Roman month), a method of numbering and arranging days, weeks, months, and years, or a mechanical contrivance for registering that arrangement. The day is a natural division of time varying slightly in length, but so slightly that a clock keeping mean or average time seldom differs 15 minutes from the time as given by the sun. Civilized nations usually commence the day at midnight, and count two periods of twelve hours each in the day. Astronomers and navigators since the time of Ptolemy commence the day at noon, and number the hours from 1 to 24. - The week is not a natural division of time, although four weeks are nearly a lunation, and many periods in the animal economy, such as the incubation of eggs, correspond singularly with weeks. The use of the week in eastern nations from time immemorial is by some ascribed to the effect of divine command, as recorded by Moses, and by others to the number of conspicuous planets. Our common names for the days of the week are Saxon in form, but evidently were borrowed originally from some eastern nation, as the gods to whom each day is consecrated correspond in character to those to whom the days were consecrated by the Greeks and Romans, when they adopted the week from the East; for these nations originally had no weeks. - The Greeks divided the month into three equal decades, the Romans into three very unequal periods. The length of the month was suggested, as the word shows, by the moon, which completes her changes in a little less than 30 days. But inasmuch as the solar year does not consist of an even number of lunar months, the months have in most nations become fixed periods of 30 or 31 days. The length of the month in most civilized nations has been copied from the Romans. No nation has, however, followed the singular division which the Romans made of the month by means of three special days. The first day was called the calends, because it was an ancient custom of the pontiffs to call (Lat. calare) the people together on that day to apprise them of the festivals or days to be kept sacred during the month. The 13th or 15th day was called the ides; the nones were the 9th day before the ides, and the other days of the month were numbered from the next succeeding calends, nones, or ides. The day, for instance, which we call Feb. 19, they called the 11th before the calends of March. The calendar shown in the engraving, found in Pompeii, indicates the number of days, the average length of the days and nights, and the festival or sacred days, in each month. - The solar year is a natural period, formerly measured by the interval between two successive vernal equinoxes. If the civil year corresponds with the solar, the seasons of the year will always come at the same period. But in early times the Roman pontiffs regulated the length of the civil year so imperfectly, that in the days of Julius Caesar the spring occurred in what the calendar called summer. Caesar, with the help of Sosigenes, reformed the calendar in 46 B. C, and introduced our present arrangement of having three years of 365 days followed by one of 366, dividing the year into months nearly as at present. The irregularity of alternation in the months of 30 and 31 days was introduced a few years after to gratify the vanity of Augustus, giving his month of August as many days as Julius Caesar's month of July. The additional day was given in leap year to February, by calling the 5th day before the calends of March a second 6th; whence leap year is still called in the almanacs bissextile year (bis, twice, and sextus, sixth). This calendar of Julius Caesar is still used in the Russian empire, and was in use in all Europe till 1582. Its error consists in giving the year a length of 365 1/4 days, which is about 11 minutes too much, an error which has now amounted to about 12 days. Pope Gregory XIII. ordered Oct. 5, 1582, to be called the 15th, and that all centu-rial years which are not multiples of 400 should not be made leap years; thus 1600 was a leap year, and 2000 will be the next that falls on a centenary year. This is called the Gregorian calendar, and is at present used in all Christian countries except Russia. It is a method of intercalation which reconciles with much accuracy the civil with the solar year. The latter consists of 365 d. 5 h. 48 min. 49.62 sec. The Gregorian rule of omitting three leap years in every 400 years, reducing these to 146,097 days, gives to a civil year an average duration of 365 d. 5 h. 49 min. 12 sec, which exceeds the true solar year by 22.38 seconds, and amounts to the difference of a day only every 3,866 years. The most intricate matter in the calendar is the ecclesiastical rule governing the movable feasts. The council of Nice ordained in the year 325 that Easter should be celebrated on the first Sunday after the full moon that occurs on or next after the day of the vernal equinox. The days of the week are denoted by the first seven letters of the alphabet, A being placed against Jan. 1. The dominical letter for the year is the letter which will then come against Sunday. The solar cycle is a period which restores the first day of the year to the same day of the week, by means of which we can find the dominical letter for any year, and therefore tell what day of the week it was or will be at any given date. The lunar cycle is a period which restores the new moon to the same day of the month. The golden number indicates the place of any given year in the lunar cycle, so that by means of it we can tell on what day of March the full moon falls, and thus find Easter day. The Gregorian calendar, civil and ecclesiastical, was soon adopted in the Catholic states. In the Protestant states of Germany it was but partially adopted in 1700, and not wholly till 1774. The change from Julian to Gregorian reckoning was made by act of parliament in Great Britain in September, 1752, the 3d of the month being called the 14th. - The ancient Egyptians, Chaldeans, Persians, Syrians, Phoenicians, and Carthaginians, each began their year at the autumnal equinox (about Sept. 22). The Jews also began their civil year at that time, but in their ecclesiastical reckoning the year dated from the vernal equinox (about March 22). The beginning of the year among the Greeks until 432 years B. C, when Meton introduced the cycle called after him, was at the winter solstice (about Dec. 22), and afterward at the summer solstice (about June 22). The Greek astronomers had a solar year peculiar to themselves, to the months of which they gave the 12 signs of the zodiac. The Roman year from the time of Numa began at the winter solstice. It was not probably the original purpose of Caesar to change this time of the commencement of the year, and his motive for delaying it several days till Jan. 1 was doubtless the desire to make the first year of the reformed calendar begin with the day of the new moon. Among the Lathi Christian nations there were seven different dates for the commencement of the year: March 1; Jan. 1; Dec. 25; March 25 (beginning the year more than nine months sooner than we do; this was called the Pisan calculation, and, though unknown in Spain, England, and Germany, was followed in several states till 1745); March 25 (beginning the year nearly three months later than we do; this was called the Florentine calculation, and was much in use from the 10th century till 1745); at Easter; and on Jan. 1 (but one year in advance of us). In France the year began in general at March 1, under the Merovingians; at Dec. 25, under the Carlovingians; and at Easter, under the Capetians. By edict of Charles IX., in 1564, the beginning of the year was ordered at Jan. 1. In England, from the 14th century till the change of style in 1752, the legal and ecclesiastical year began at March 25, though it was not uncommon in writing to reckon it from Jan. 1. After the change was adopted in 1752, events which had occurred in January, February, and before March 25, of the old legal year, would, according to the new arrangement, be reckoned in the next subsequent year. Thus the revolution of 1688 occurred in February of that legal year, or, as we should now say, in February, 1689; and it was at one time customary to write the date thus: February, 168 8/9. - The year of the French revolutionary calendar, which was instituted in 1792, began with Sept. 22. It consisted of 12 months of 30 days each, with five sacred days at the end devoted to festivals, and called the sansculottides. The months were divided into three decades of ten days each. Every period of four years was termed a franciade, and was terminated by six instead of five festival days. The more accurate ad-justment was arranged according to the Gregorian regulation for leap year. The Gregorian calendar was restored in France, Jan. 1, 1806. - The ancient northern nations of Europe began their year from the winter solstice. In the era of Constantinople, which was in use in the Byzantine empire, and in Russia till the time of Peter the Great, the civil year began with Sept. 1, and the ecclesiastical sometimes with March 21, and sometimes with April 1. The beginning of the Mohammedan year, which is lunar, is not at any fixed time, but retrogrades through the different seasons of the solar year. The later Jewish year is lunar, but by the intercalation of a 13th month 7 times in a cycle of 19 years is brought in harmony with the solar periods; it begins at the autumnal equinox. Among most of the peoples of the East Indies the year is lunar, and begins with, the first quarter of the moon the nearest to the beginning of December. Among the Peruvians the year began at the winter solstice, and among the Mexicans at the vernal equinox. The year of the former was lunar, and was divided into four equal parts, bearing the names of their four principal festivals, instituted in honor of their four divinities allegorical of the seasons. The Mexicans had a year of 360 days and 5 supplementary days. They divided it into 18 months of 20 days, and had a leap year. (See Chronology, and Year).